Best for: Puréeing or liquefying vegetables, beans, or soups; making baby food; emulsifying sauces such as mayonnaise or pesto; or mixing drinks. How to buy: A blender has a base housing a motor and a glass, plastic, or stainless steel jar with a lid on top and blades in the base. There are two schools of thought about traditional blenders: either buy the expensive, powerful blender that will last longer, or the cheaper blender which won’t last long (because the motor gives out). With the environment in mind, I endorse buying the expensive blender, though it may not last much longer than the other. Either way, look for a blender with the blades set low in the container so you can purée small amounts if needed. Buy the largest blender possible because you can only fill it halfway or the contents may spray. The container should be clear and made out of toughened glass or heavyweight plastic (make sure it isn’t thin or it will crack). The lid should have a removable plug or handle which allows you to add more liquid while the machine is running. Why buy one? If you need to purée something quite liquid, you will need a blender. Food processors will spill the contents if they are too liquid and don’t produce as fine a purée. Blenders are versatile and can be used for a variety of tasks. How to use: Place the food into the blender, ensure the lid is tightly fit, and turn it to the desired speed. Don’t fill more than 2/3 full when using. Best for: Making bread and cakes. How to buy: Look for a bread machine that is compact, lets you set the timer so it can bake overnight, allows you to use different types of dough, and has a compartment for nuts, seeds, and dried fruit to be added automatically later in the process. The bread basket should be easy to put in and remove, easy to operate, and easy to clean. Why buy one? This machine can produce freshly baked bread ‘straight out of the oven’ when you wake up. It takes five minutes to add the ingredients and turn on. The machine is easy to wash. The bread may not be as good as bread from a bakery but it’s more convenient. You can also mix and knead the dough in the machine, finish it by hand and bake it in the oven. How to use: Measure the ingredients into the compartment in the order required. Turn on the machine, set the timer and wait. Best for: Deep-frying vegetables, meat, pasta, fritters, doughnuts, funnel cakes, etc. How to buy: Look for an electric, thermostatically controlled deep-fryer with a lid that also has an accurate temperature indicator to tell you when the desired temperature has been reached. It should have a non-stick lining that is easy to clean. It should be easy to fill and drain, and have a wide, shallow stainless steel wire mesh basket to lift out of and lower into the fat. Look for a basket with handles that clip to the fryer so that fat can drain back into the fryer. The temperature should be able to be held constant and to reheat quickly after the food is introduced. Some deep-fryers have a rotating basket or blow the oil around to reduce the amount of oil needed. I have the blower type that has a rotating paddle which works well for being low fat, but the paddle crushes softer food and you can’t fry battered food in it. Why buy one? They are safer than a heavy-bottomed pot with a deep-frying thermometer as the heating element is enclosed, and only goes to the selected temperature – and then holds at that temperature. The lid and filter contain the smell of deep-frying. It’s only a good idea if you deep-fry a lot, however; otherwise it is not worth the extra counter space. I wouldn’t buy another one as I rarely deep-fry food. How to use: Fill the machine with oil and turn on to the desired temperature. Fill the basket with food and lower into the oil. Remove when cooked, allow the basket to rest above the deep-fryer so the oil drains back inside. Best for: Making espresso and espresso based drinks. How to buy: The most beautiful espresso machines are often difficult to use, clean, and maintain. Nespresso have come up with a great solution to the problem with their Nespresso pods which taste great but which some people say are not environmentally sound. Many Italians, in secret, have admitted to me that they like Nespresso, but of course they prefer to go to their favourite coffee bar. Why buy one? Sometimes the coffee bar is closed or seems impossibly far away. How to use: I can’t tell you how to work a real espresso machine despite having watched them myself millions of times. My guess is that it’s like riding a bicycle, much more difficult than it appears. The Nespresso machine, which I openly admit to adoring, is so simple my 18-month-old son makes cappuccino in it (closely supervised of course!) Turn the machine on, if using frothed milk (cappuccino has more froth than milk while latte has more milk) turn on the frother and wait for the yellow light to be constant, place the milk under the frother and turn on until the milk is the temperature and has the amount of froth you are happy with. Open the compartment and place a Nespresso pod in the chamber and close it. Turn on the coffee until you are happy with the amount and turn off. Add the coffee to the milk. Best for: Great for chopping, slicing, grating, puréeing, blending, emulsifying, and mincing large amounts of pretty much anything: dough, cheese, vegetables, meat, nuts, fruit, etc. It is not great for whipping eggs or cream (use a mixer or a whisk) or for fine puréeing (use a blender). How to buy: The base houses a motor with a removable bowl that encases a blade and has a lid. It should come with different discs for cutting, grating or mixing. Choose a model with a heavy-duty motor and a circuit breaker to stop it from overheating. Find one with a large bowl as it cannot be filled completely and still function properly. Find one that is unlikely to leak when pulsing liquid and with a sturdy bowl so it doesn’t shatter if you drop it. The base should have rubber on the feet so it doesn’t move when turned on. Nearly all food processors have a feed tube in the lid with an attachment to force objects through it onto the spinning blade, and allow for operation either by on-off pulsing or running the motor continually. Small plastic parts should be easily cleaned and able to go into the dishwasher. Some have attachments you can buy that will squeeze citrus fruit, grind coffee, make fresh pasta (I personally would not use this), and grind meat. Why buy one? This machine can save you lots of time and effort. How to use: Assemble the machine, place your food inside, attach the lid, and turn on. Best for: Puréeing vegetables, beans, or soups, or making baby food. Handheld blenders are particularly useful as you can purée the soup while it is in the pan, saving time and effort cleaning. Why buy one? Handheld blenders can be used for a variety of tasks. Some come with a whisk attachment you can use for whipping eggs, batters, and cream, and a food processor attachment that can be used for chopping almost everything. They save time compared to hand chopping. For soups and sauces, the texture is different than using a food mill and generally speaking, the texture from the food mill is preferable but the process is more time consuming. I use my handheld blender or one of its attachments every day. How to use: Place in a large, deep cup or tall pot, ensuring it is completely immersed, and turn on. Best for: Beats, whips, or mixes sauces, batters, cream, gelato base, and eggs. Not good for dough or heavy-duty items. Mix these by hand or use a standing mixer. 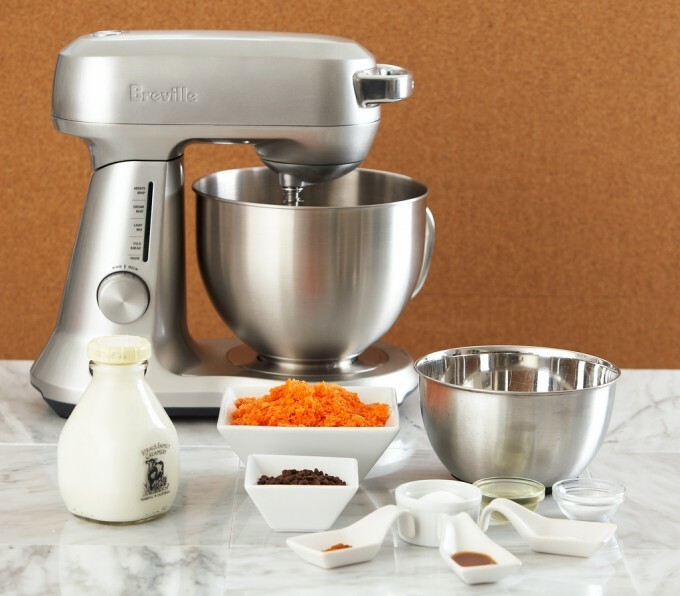 How to buy: Buy a hand mixer with a quiet, heavy-duty motor and variable speed buttons which are easily controlled with your thumb while holding the handle. There should be a release button for the beaters so they can be removed easily and washed. Look for slim wire beaters. Why buy one? It is better than whisking by hand but only has one function. It’s handy for mixing over a pan on the stove top. If you cannot afford a standing mixer buy a hand mixer. The hand blender with the whisk attachment can take light jobs like whipping egg whites and creams but cannot handle heavier batters, which this one can. Bread dough can only be done in the standing mixer, however. How to use: Attach the beaters, dip the beaters into the liquid, and turn on. Keep the beaters on the bottom of the bowl so they don’t spray liquid everywhere. Best for: Making ice cream, gelato, sorbet, and ices. Why buy one? Necessary if you want to make ice cream, gelato, and sorbet. How to use: Prepare your mixture, cool it, and add it to the machine; turn on. Best for: Grinding meat for meat sauce, meatballs, meat loaves, patties, etc. Stuffing sausages. My mother also uses it to grind chillies for hot sauce. How to buy: Meat grinders have a feed tray and a separate pusher to feed meat into the chamber, and should come with discs that grind the meat in different sizes. Meat grinders can be hand cranked or electric. My mother would be upset if I told you to buy an electric one but that’s what I would buy. (She also cries as she hand-cranks the chillies for her hot sauce.) If you buy the hand-cranked grinder, make sure it can attach firmly to your table top and be prepared for it to jam occasionally. They are made of plastic, metal, or a combination. Metal is better for durability, and should be easier to operate: they shouldn’t jam too much and the crank should be comfortable to use. They should be easy to clean (ideally able to go in the dishwasher) and care for (some need to be oiled). Why buy one? You can achieve the perfect texture by grinding meat yourself, and also be sure of exactly what is in your ground meat. Alternatively, you can put the meat into your food processor and pulse it a few times but the resulting texture is not the same. How to use: Select the die you want and attach it to the grinder. Generally, a 1.5-2 mm die is good for pâté, 4.5 mm is ideal for ragù (meat sauce), and 8 mm is best for lardo. Place the meat into the chopper and turn it on (or start cranking). Best For: Great for mixing, beating, whipping, or kneading batter and dough for cakes, tarts, bread, etc. Very good for mixing sauces, batters, crushing fruit, and whipping eggs or cream. How to buy: A standing mixer is an electric machine with a motor which overhangs a bowl with a 5-38 litre capacity. Look for a mixer with a heavy-duty motor and a 4 to 5 litre capacity stainless steel or toughened glass bowl. There should be three attachments: a whisk, a thicker metal beater, and a dough hook. Ensure that when the mixer is on, the attachment reaches right down to the bottom of the bowl. This guarantees that the contents are evenly mixed and enables the mixer to work even a small amount of liquid. There should be controls for varying the speed and the base should have rubber feet to keep the machine from moving around. There are two types of standing mixer: those in which the beaters stay in place and the bowl rotates, and those in which the bowl is stationary while the beaters move. Some models can adjust the beater height so that you can better incorporate the ingredients. Some have splash guards, timers, fold functions and counter grips. Some also have attachments for grinding sausages or mince, making pasta (I do not recommend this) or ice cream, extracting juice, slicing potatoes, and grinding coffee. Buy only the attachments you will actually use – and make sure that the motor is capable of handling these functions. Why buy one? These machines save a great deal of time and effort. There are many recipes you won’t bother with unless you have one. They are expensive, however, so purchase only if you will use it frequently. How to use: Add your ingredients to the bowl, attach the bowl to the mixer, attach the attachment you prefer to work with, put the bowl in position, and turn on.